Hello Sweet Friends! 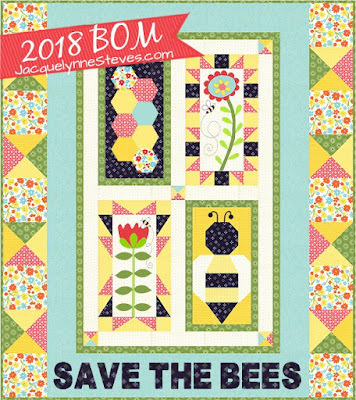 Today I'm BUZZING with excitement, I can't wait to share my cute Block 4 of the FREE Save the Bees BOM by Jacquelynne Steves. If this is the first you've heard of this BOM you can find all the details over at Jacquelynne's blog by CLICKING HERE. The block for this month is the adorable bumble bee block in the bottom right corner of the image above. I've been using the blocks to make small wall hangings for my mini quilts wall using only scraps from my Lakehouse Drygoods scrap bin. Well I'm still working from those scraps but I'm adding other fabrics also. With Jacquelynne's BOM's she always has several options for making the blocks. Embroidery, applique or a plain block to showcase your favorite fabric. She also encourages creativity and making the quilt your own. With each block I've tried to do something a little different. Fussy cutting, different applique method or color placements. So I wanted to keep the creativity going with Block 4. 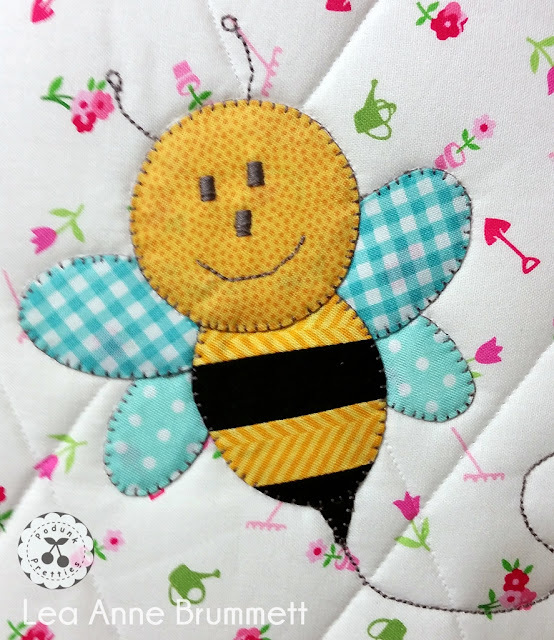 Meet Baby Buzzy! 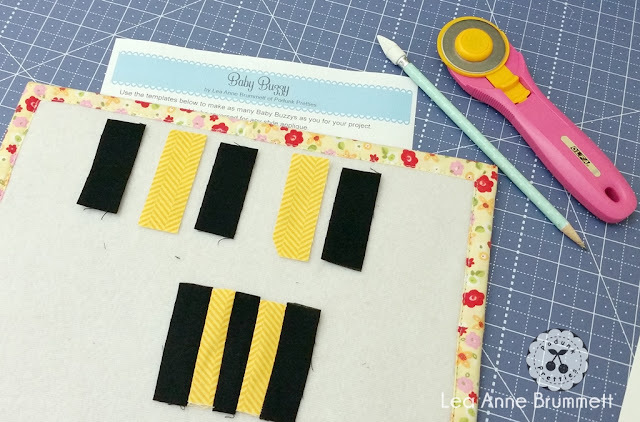 This sweet little wall hanging uses the directions from the pattern for a plain fabric block. Then I added Baby Buzzy. 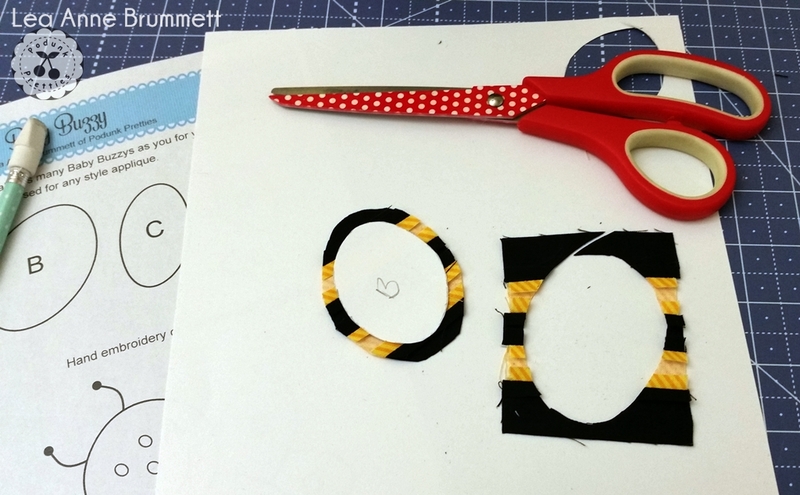 The idea came from these yellow and black 1" x 3" scraps. Card stock was used for my templates and a light box to trace my shapes. A little bit of basting spray on the back of the template after is was cut held it in place while I cut the fabric. The basting spray held my template in place while cutting and folding over the edges with starch and and iron. The light box was used again to trace the face onto Buzzy. He was so cute I had to make 2! 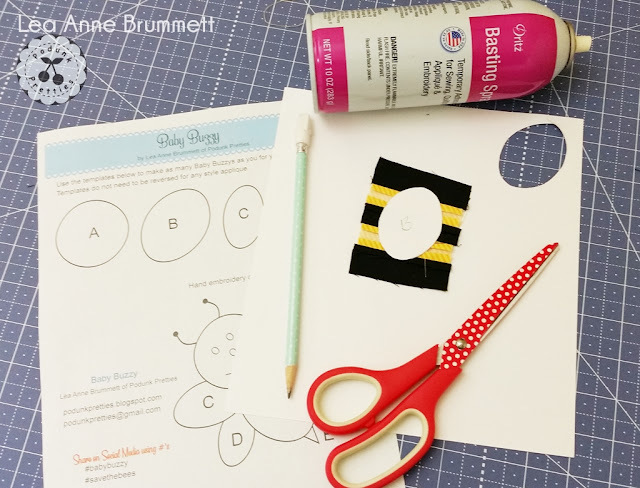 A little tip for turned edge applique: Use applique basting glue or washable school glue to hold the pieces together before adding them to the background fabric. I used washable school glue, just a few tiny drops and then I held them in place for about 20 seconds. No iron is needed, unless you don't want to wait 20 seconds. As with my previous blocks in this BOM gray thread and a small machine blanket stitch was used to hold the applique in place. The antenna, face and flight lines were also machine stitches. These two little Bug-gers look like they are having a good time collecting honey in Lakehouse Garden. I'm sure you noticed the print out for Buzzy in the pictures above. It's my FREE gift to you for visiting and following along in the fun. Download and print it by clicking here. 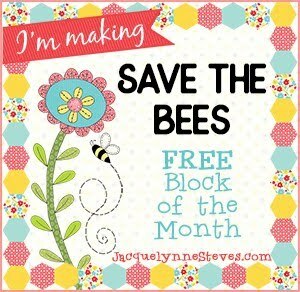 Don't forget to share your Save the Bees blocks once they are finished. You can do that in the SewQuilty Facebook Group. 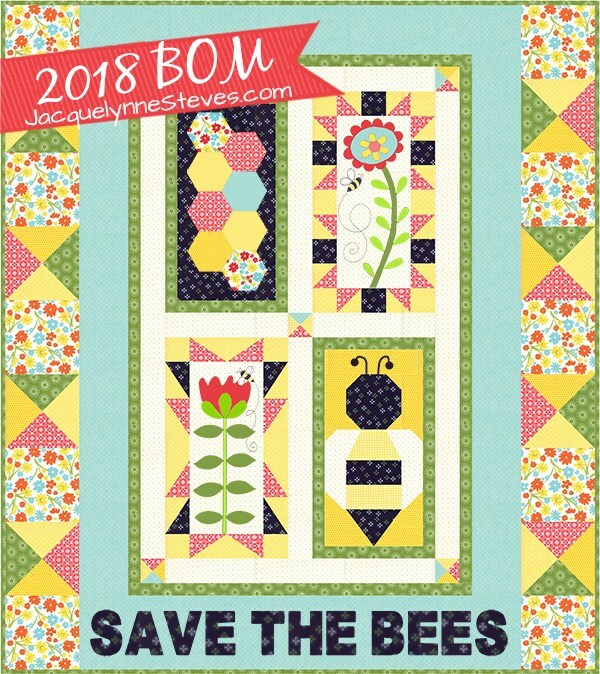 If your posting on your own Facebook feed or other social media sites, Make sure to use #SaveTheBeesQuilt and #SaveTheBeesBOM. This months Giveaway is sponsored by Olfa. I only use Olfa rotary cutters. The first one I bought is still in use today even though I own 6. What can I say...I love the new colors! In the last year they have came out with new cutting mat colors.....SO CUTE! 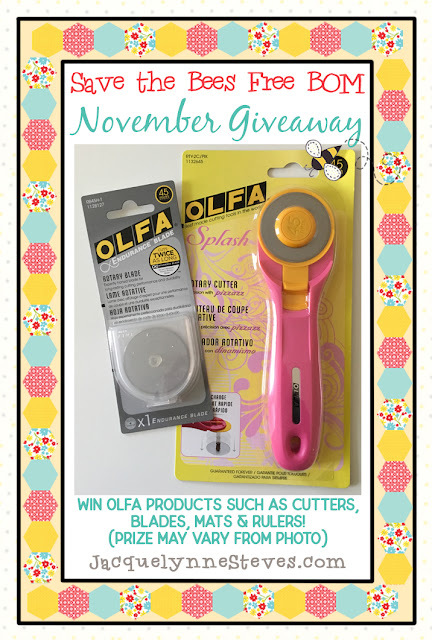 Hop on over to Olfa to view all their awesome products. The image below shows what you COULD win. Prizes may vary for each winner. 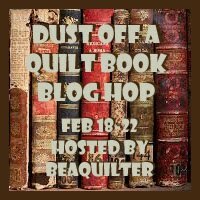 Make sure you visit all the blogs participating in this blog hop for more chances to win. 1. One prize per person per month. 2. If you are the winner you will have 72 hours to respond or a new winner will be chosen. 3. Enter by the end of the day Sunday, November 11, 2018. 4. A winner will be chosen at Random. 5. All you need to is click the little blue button below at the bottom of this post. It looks like this but smaller. Add your name and email address, leave all other fields blank. Then click submit. Leaving a comment in the comments section of this post will not enter you in the giveaway but you can still comment! I use this method for the contest so I have a way to contact everyone who enters. In the past winners could not be contacted. This ensures you're entered and that your email is not out there for everyone to see. Only I can see the email address. I do not share them with anyone or use them for anything other than to contact you if you win. Thank you for stopping by my little spot in Podunk....Good Luck! So so sweet Lea Anne!! Love the colours in your project! 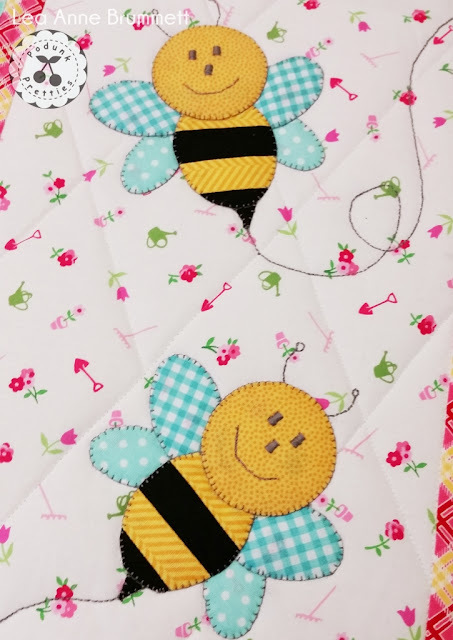 Thank you so much for the adorable baby bees! Your Baby Bees are so cute! I love them. Just love love love your bees! 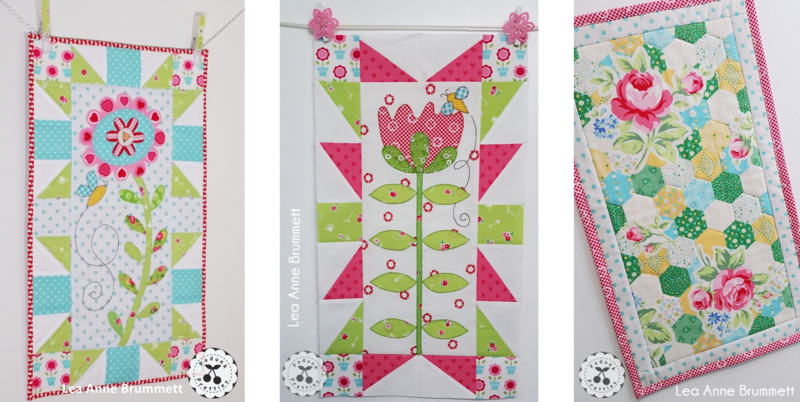 The wall hanging is so very cute! Thanks! Love the cute bees--thank you! Love Baby Buzzy! Thanks for the free pattern! Those babies are sooooo cute. Thank you for sharing the pattern. 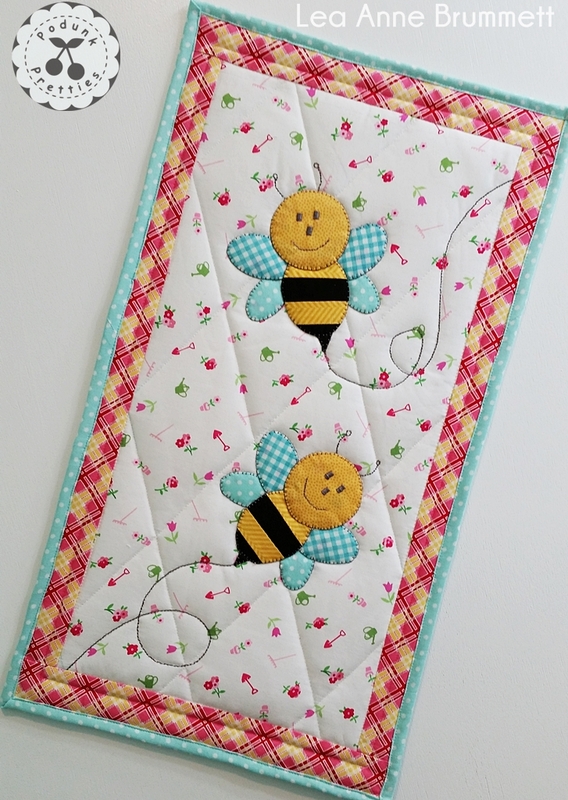 Love the fabric you chose for this Bee BOM! the bees are too cute! Your baby bees are adorable. Oh so cute. Thank you for the pattern. Oh oh oh, I just love your block. I was gathering my fabrics for block 4, but now that I've seen yours, I'm glad I didn't start cutting yet. Thank you so much. 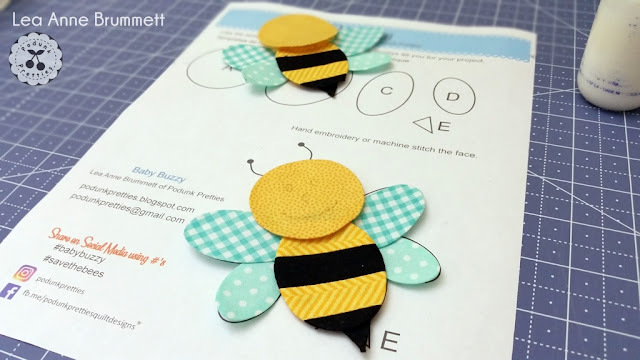 Baby Buzzy is very cute! Thanks for the pattern. These are the cutest ever. Gosh those baby bees are a cuteness overload! So glad I came to your page.I love your baby bee block. It's going in my quilt. Thanks! !